Senator Antonio Trillanes IV has warned Justice Secretary Vitaliano Aguirre II that he will soon be the subject of a Senate probe for accusing him and Senator Leila de Lima of involvement in the stabbing incident which wounded high-profile inmate Jaybee Sebastian. 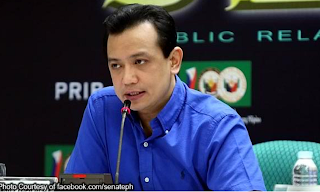 In a text message to reporters Tuesday (Jan. 3), Trillanes denied having a hand in the attempt on Sebastian’s life last Sept. 28 inside the New Bilibid Prison. “I categorically deny any involvement in stabbing incident of JB Sebastian. Why would I even do that? It is totally absurd,” he said. “Anyway, Aguirre and his gang better get their stories straight because we will have a full blown Senate inquiry to get the truth out,” the senator added. The stabbing incident left Sebastian and three others wounded and convicted crime lord Tony Co dead. Citing information from an inmate, Aguirre claimed earlier in the day that Trillanes and De Lima planned the threat to Sebastian’s life to prevent him from testifying on the drug trade inside the national penitentiary. Sebastian had claimed he collected drug money from NBP inmates for De Lima’s campaign kitty.